Following a series of unfortunate events, which I won’t go into here, we have decided to relocate. Bamboo has run from rented office space for over ten years now, and it’s never been as simple as it should be – Landlords take note, your tenants are NOT on-site maintenance staff, estate agents or fire marshals. We decided to try some kind of co-working space instead. This would allow us to do be based where we wanted and hopefully cut costs and meet more like-minded people. Having viewed a few options, we decided that the Northern Quarter in Manchester was the place for us. It’s where we felt most comfortable, and it’s full of similar, exciting businesses. We had heard of Ziferblat before, a strange, but simple concept ‘Everything is free inside; Except for the time you spend’, so we gave that a go. The principle is very simple, it looks and feels a bit like a cafe, except you server yourself. There are plenty of drinks – tea, coffee etc, and lots of snacks available – cake, biscuits, cereals, that kind of thing. The big difference is that all the food and drink is free, as well as the superfast WiFi, all you pay is eight pence a minute for the time you spend there. The first time we tried it we were hooked, it is such a fun, cool place to work that nothing else came close, so after speaking to very friendly people who run it we signed up for a co-worker account which means we get unlimited access and get to use it as our postal address. Now the last bit might sound a bit odd, but in our industry location is everything (Google ‘web design Manchester’ to see what I mean), and this has allowed us to ‘relocate’ Bamboo to the Northern Quarter in Manchester, without moving anything physical and more importantly without signing any kind of lease. 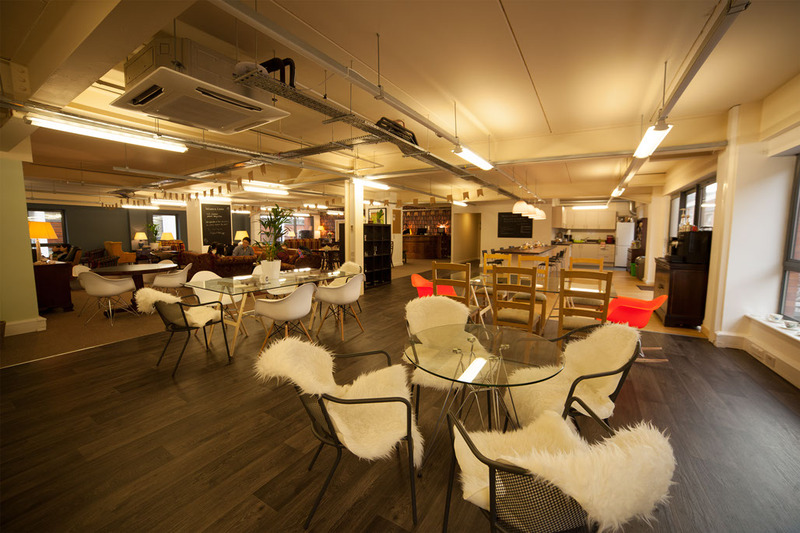 So after ten years of being based in an office in Bury, Bamboo is now based in the Northern Quarter – and we love it!